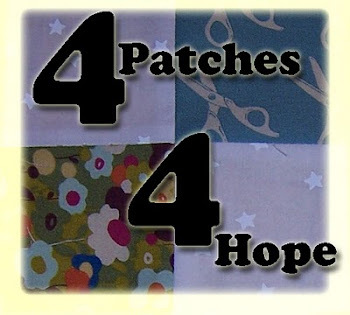 Joan Hawley of Lazy Girl Designs has done it again - come up with a cute, quick, simple and FUN pattern - for something so versatile and useful! The Maggie Bag! I just got my copy of the pattern and in no time flat was able to whip together a few of these cuties! These are not quite done yet - I need to add some embellishments to the flaps, but I thought I would show what I have done so far. I first tried one by the pattern - the turtle one - with no loop. 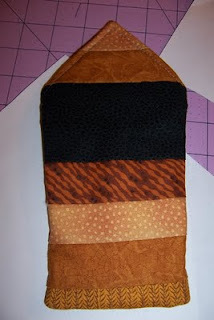 It has an orange lining, and fusible velcro to hold it closed. It was fun but I could see that working with a directional fabric might be challenging, as I tried to keep my turtles from standing on their heads. 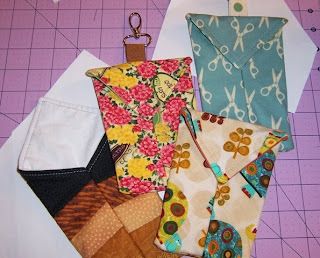 The pink floral one is some scrap fabric I had - and I used a Handy Tab and swivel clasp to make it hangable. I want to shorten the Handy Tab up a bit though because the swivel clasp is heavy and makes the bag top heavy. On the tan and black one, I cut out the template from flannel, then layered strips of scraps on top - stitching and flipping - until I covered the entire piece. 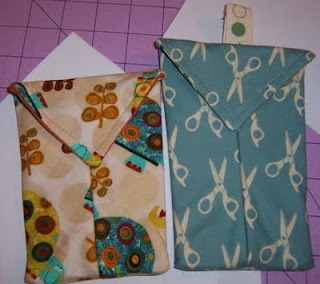 I trimmed it, layered it with the lining and had a fun little pouch. The strips don't line up on the center seam, but I think it works for what I wanted. I did not get a picture of the little one - I think the Munchkin ran off with it - but it is cute and perfect for business cards and other little treasures. I am thinking of using it as gift packaging for some jewelery I hope to make for the holidays. Very addicting - be warned! You know how sometimes you enter a giveaway on someone's blog - and then forget that you did? Or maybe you didn't but they surprised you with something anyway? Not sure which is the case - but the upshot was that, according to the note I got today (Friday the 13th), I was lucky #13 in a drawing and won some fabric. Not just some fabric - I should add - but turtle fabric. 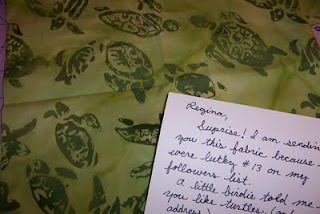 And not just turtle fabric - but batik turtle fabric! 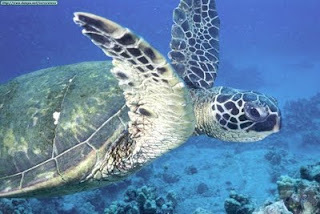 It's a medium green sea turtle on a lighter green background - I will have to get a photo and add it some other time - as I am not sure where the camera is right now. I'm Here... and I'm a Winner!!! Thought I fell off the face of the earth? Nah - just been spending a lot more time sewing and a lot less time writing. Also had Halloween in there ...and groups, and Facebook, and swimming lessons for the Munchkin, and cleaning up the yard for the winter, and work... and I think you get the idea. 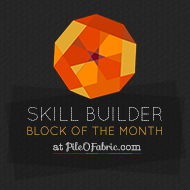 I've missed the blog though. 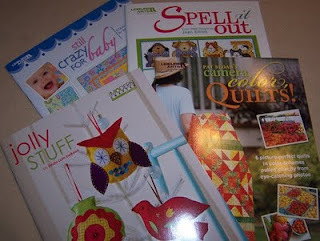 Three quilt books and one cross stitch - all from Leisure Arts. Some wonderful stuff - especially the Pat Sloan Camera, Color, Quilts! I am loving the one on the cover especially! And I am loving every bit of it!